Before we begin to understand how to have more of something, we first have to define what it is. When most people hear the word creativity, they think of a painting, drawing, sculpture—some manifestation of art. However, it is possible to paint a picture without creativity, and we even may have a difficult time deciding if it is creative or not. Some people may say it is, while others would say that it isn’t. This is why some people like a particular painting, while others don’t. But what they are really talking about is art, not creativity. Art can be creative or not. What most people consider creativity is just a byproduct of creativity, not creativity itself. How can we define creativity and distinguish it from its manifestation, art? Let’s say that you have decided to cook dinner for someone special. You set the table with your favorite flowers arranged just the way you like them, and glasses that you bought because they added that extra touch; they even match the feel of your plates. You take your time preparing the meal, cutting the vegetables your own way, and carefully placing everything on the plate so it looks exactly like the image in your mind. We have all heard this statement—I did this with love. What does it mean to do something with love? Let’s compare it to its opposite. The next day you leave work, rushing home to cook dinner for yourself before going out to meet some friends. You cook and eat within minutes. What is the difference between this and cooking with love? Doing it with love, you focused on what you were doing. You were present. Because you cared there was a direct connection between what you were feeling and what you were expressing. Emotional connection. There was smoothness to your movements in the kitchen, no over-thinking. Intuitive flow. The next night when you were cooking, you were thinking about how much time you had before you would be late, what you would wear, if you had enough time to take a shower, etc. You were not present. You didn’t care how the plate looked. You weren’t connected to what you were doing. No emotional connection. If you really paid attention, you would probably have noticed that you were holding your breath a lot. Our breathing becomes erratic when we aren’t present. This is why in yoga we talk about consciously breathing as it brings you into the moment. When Should You Be Creative? You do not have to paint a picture to live creatively. Living creatively means taking your time and being present with everything you do while putting your personal touch into whatever action you take. You can be creative cleaning your house. You can be creative in anything you do, just the same way that you can do things without creativity as well. It is possible to paint a picture without creativity. People may look at the picture and like it. It may be a very nice picture, but if it doesn’t have your personal touch, it wasn’t done with your creativity, with your love. Love and creativity are synonyms; there is no distinction between the two. You are pure creativity: you are the creative manifestation of the creator. Your natural state is love. When you allow your authentic inner experience to manifest, this is love and creativity. Living creatively with your personal touch is connecting with your essence. Why Are Emotions So Important In Creativity? A scientific study concluded that artists experience the widest range of emotions out of any group of people. Furthermore, writers experience the widest range out of the group of artists. This is not a surprise, but how do emotions allow you to be creative? Emotions are the colors for your picture. The better you are at relating and articulating your emotions, the more you are connected to yourself. The more connected you are to yourself, the more connected you are to your environment. This connection allows you to manifest your personal touch. The wider the spectrum of emotions you are able to experience, the more colors on your palette. If you could only say that you are happy or sad, how colorful is your expression? How colorful is your life? However, if you can articulate (to yourself and others) so deeply about your sadness and create vivid pictures through your personal touch that represent your feelings, you have depth to your experience and expression. How To Go Deeper With Your Creativity? Remember you are a creative being. You must continuously go deeper within to become aware of the subtleties. This is what is special to your experience. The process of creativity is also the process of self-awareness. Creativity means expressing yourself without attachment. Many times our expression is inauthentic because of a lack of connection and insight to our emotions. We allow projection, attachment, as well as physical, mental, and emotional impulses to restrain our understanding. All feelings can be used in your creativity, but there needs to be honest understanding allowance to possess definition in your expression. Otherwise, you are a painting with broad stokes. It is vital to be open and allow yourself to interact with what you are doing without resistance. Self-expression cannot flourish with self-judgment. There is no limit to your creativity, just as there is no limit to you through your connection to the infinite—God. Manifesting your creativity means connecting to how you are experiencing this existence in the present moment, then finding a way to relate it to whatever you do. When you can get to this point and allow the intuitive flow of your experience be represented in your actions, you are being creative. This is the trick to happiness as well. Taking your time and personalizing your actions makes every task more enjoyable. Be present. If this is challenging, take 10 minutes each day to consciously breathe: focus on each breath. Continue building up the time. This will help you let go of worry, fear, and anxiety. Contentment exists in the present, not the future or the past. Breathing is the anchor that keeps you in the present. Be connected. Learn to build a relationship with your emotional self. Keep a diary to practice articulating your feelings. Building the vocabulary and not using words of judgment are the most difficult aspects of understanding. Be intuitive. Learn to open up your intuition by connecting to your higher self through meditation. If you can stop the noise of your mind, you will hear the intuitive voice. Be open. 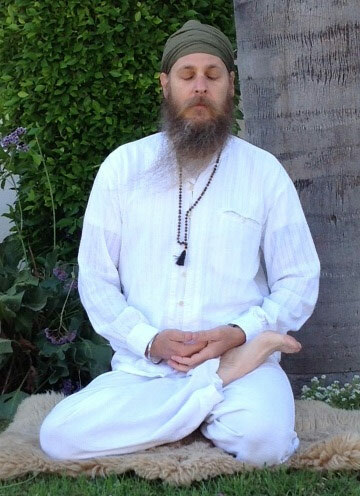 In Kundalini Yoga, Yogi Bhajan taught us the Trea Kriya with the mantra – Ong Sohung. Ong is creative consciousness; Sohung is I am thou. Ong Sohung: I am creative consciousness. This mantra is a reminder of your essence and opens your heart to allow your creative love to flow. To do the Trea Kriya, sit on the left heel (with the foot at the perineum), put the right foot on the left thigh, both knees touching the ground, and hands cupped on the lap below the navel center. Inhale pulling the diaphragm up and chant from the heart: Ong Sohung, allowing the “ng” in each word to resonate in the heart and the back of the throat. You can practice this from 3 to 31 minutes. You are a creative being. Learn to radiate your personal touch with love in all your actions.